As we approach the two year mark of our time in Iowa, we find ourselves doing less unpacking and more sweeping our dirt out from under the furniture. We're better adjusted and more confident in our abilities to do grown up things like paying bills. We aren't newlyweds anymore. Suddenly, life is daily. Though dailyness has a reputation for being a grind, it also brings routine and relaxation. I find that I don't examine my relationship with Owen as much anymore; I just live it. The most recent and un-daily event I have to share is the passing of my family's dog, Rascal. The last I saw him was at Christmas, and even though he was grey in the face, he still had his puppy-like energy that had once been part of my daily life. It is difficult to imagine that when I go home to Colorado in three weeks he won't be there to greet me. 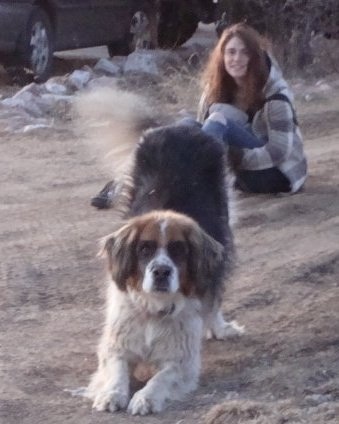 When we first met Rascal as a puppy thirteen years ago the people selling him claimed that he was a pure-bred St. Bernard, but that they just didn't make the effort to get papers together. In reality he was a mostly-St. Bernard. Rascal was not a well trained dog. If you called his name he was just as likely to run away from you as to you. On hot days he would swim in the pond by our house and then run up and thwack you with his giant tail sopping with pond scum. His general disregard for systems and rules carried a certain freedom. His not-so-pedigree genetics were unexpected and beautiful, and he was always, always friendly. Though I am sad to see him leave, I was touched by the gentleness and care that my parents provided him in his final days while I was absent. Rascal's passing was one of three that we have learned about in the past week or so. Today we visited the grave of a client I worked with through the Arc and were shaken to find that her mother, who I had consoled just months before, was buried next to her. With so much death surrounding us this week, we find ourselves dealing with heightened death anxiety. Since we started dating, Owen and I both notice that we are generally more afraid for our own and each other's safety than we were before. We've transitioned from young-hearted fearlessness in the face of mortality to suddenly having a lifetime of plans to lose. Yet, even with the fear of losing the life we look forward to, we don't seem to live as fully as we would like to right now. Though the dailyness brings relaxation and routine, it also presents the potential for stagnation and stunted growth. Too often I waste entire days in a state of waiting. Constantly, I am waiting to hear back from some application that I've submitted in search of a more fulfilling daily. Yet even as I feel that some days are wasted by dailyness, those activities that are incessantly repeated are making me stronger and more capable. With every downward dog and chicken dinner I am preparing myself for the future. With every day that Owen and I pass hours talking and thinking together, we build our relationship. So when the time comes that something is not daily, we can be ready. Having Owen in my daily means that he knows all of my emotions as they pass, and so he was ready to hold me when the un-daily news of Rascal's passing came our way. Daily life is boring, and it's comforting. Sometimes it feels like chains holding me down, but my muscles grow stronger from carrying them. What we do in our daily becomes what we do in our not-daily. What skills are you strengthening every day? What emotional responses are you practicing? Summer: Sometimes she's cute. Other times she's a total pain.